FAQ #1: What are the advantages of both disciplines in one design firm? The exterior and the interior of your building will be fully coordinated in style, materials, and colors. The views from the windows will compliment the interior design of the rooms and extend the spaces beyond the walls. Outdoor rooms will become extensions of the living areas. If it suits your schedule, any renovations and re-landscaping can be done simultaneously thus shortening construction time. FAQ #2: I want my guests to be impressed with my individual style. I want a house that reflects my style–– not cookie cutter designer rooms. How can I achieve that without doing everything myself? We take pride in the fact that each of our projects looks different based on the needs and personal styles of our clients. We make dreams a reality. We work with our clients to create spaces that reflect their personalities and tastes, doing our best to understand what they want their office or home to say to others, and then assist them to achieve that communication. There is no place like your home. Please see our blog regarding personal style suggestions for achieving a home with personality. FAQ #3: I am interested in designs that are eco-friendly or “green”. Do you do this? We take pride in creating environments that are, not only aesthetic, but are practical and sustainable. We prefer to use no VOC paints, formaldehyde free carpets, eco-friendly fabrics such as those made from bamboo, flooring that will accommodate radiant heat, carpet and furniture made from recycled goods. These are some of the products that we use as much as our clients are willing. As much as possible we re-use your existing furnishings by re-covering, re-purposing, and re-painting. We love to locate and use vintage or antique furnishings. FAQ #4: How soon can I have a new living room? The shorter time allowed to do a project the more limited are your choices. But we’ve completely redone rooms for clients in an afternoon by changing out furniture and adding accessories. For custom designed furniture and upholstery the time can be from 30 to 60 days or more. FAQ #5: How long does it take to have a new kitchen or bathroom? 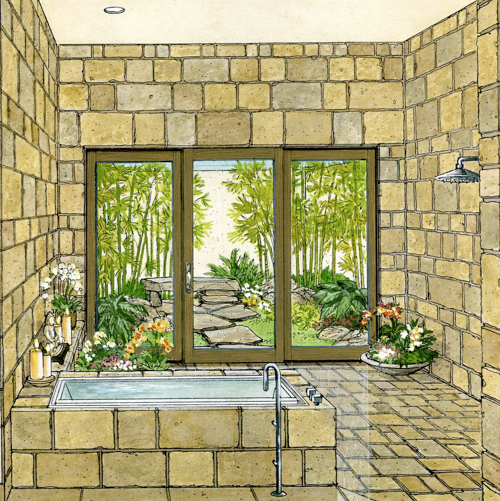 It is possible to complete a bath or kitchen in four weeks upon approval of the design. We order and allow for the arrival of all required materials before beginning demolition. This prevents any surprise delays and limits client inconvenience. We schedule the contractors getting their agreement as to the length of time their job will take. The overall length of time varies depending on the materials and appliances selected. FAQ #6: How does your service work? We offer a variety of services each scaled to fit individual needs. If you are a very hands-on person and wish to do-it-yourself, we offer a consultation service on an hourly fee. We will walk your property and house, offer suggestions, and give you a list of notes prior to leaving. This service could also include color selections with paint swatches, suggested fabrics, wall coverings, furniture layouts, window treatments, flooring, paving materials, plants, and garden layouts. Best of all, we’ll give you are our educated, experienced opinion on any decisions you may be concerned about. If you desire to be your own contractor, we will prepare plans for your approval for a new kitchen or bath, a new pool, a new garden layout, or furniture layout plans. You tell us what you have in mind and we make suggestions. We do sketches or elevations to help you understand and once we’ve agreed on a design, we draw construction plans that can be used to get bids. And you can take it from there. If you would prefer to spend your time doing your day job or enjoying time with your family we offer a turnkey service. Once we’ve agreed on a design, we will happily take care of every aspect for you. We will order all the materials, hire the contractors, observe their work to see to it that they get permits and follow the plans. We will purchase the new furniture and window treatments, etc, and handle the installations and final set-ups, right down to placing the pillows and floral arrangements in your new rooms and the chaise lounge next to your new pool. Our fees like our services are tailored to your needs. We prefer to work with flat fees as much as possible so that you have prediction as to what you are spending. FAQ #7: In what areas do you work? We are currently working on projects locally and in northern California. We have designed and installed projects in England, Denmark, Germany, Italy, the Caribbean, and throughout the United States.